I promised you a blog post about Shamanic drumming and here, I keep my promise. This is not an informative post that will teach you how to drum Shamanically: rather, it is sharing the first proper experience that Neometheus and I had with teaching ourselves this important Shamanic art. Neither Neometheus nor I are musically inclined. But for this purpose, you don’t have to be – Shamanic drumming is about connecting to the Source; the ‘Other realm’, helping to connect with [your] deities in ritual, respect, and honour. Neither do we have ‘proper’ Shamanic drums: they are expensive, and we are completely new to this. 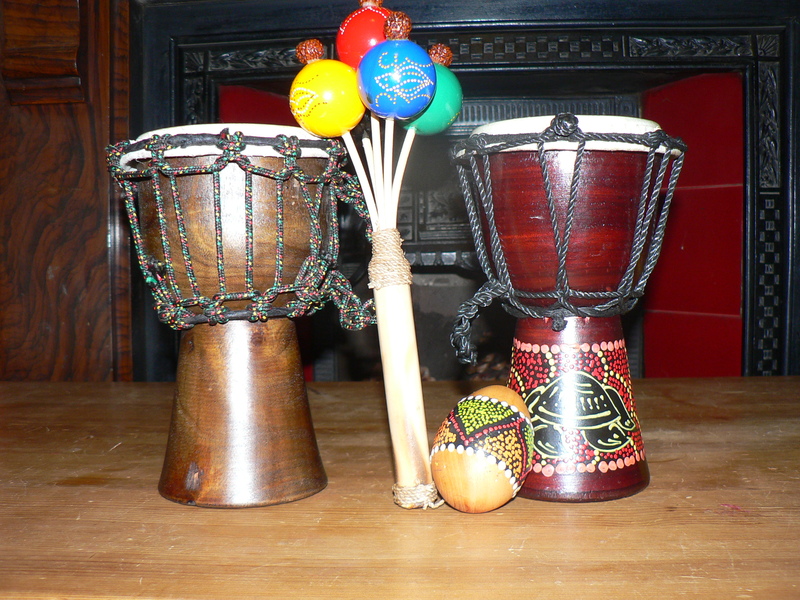 As followers of a hedge-witch path, we therefore used what we have to hand – namely, two beautiful Djembe drums. As with anything that you do in magic, ritual, or in any way connect actively with sources outside of ourselves, it is INTENTION that matters, not how much money you have spent or how beautiful or ‘appropriate’ something is. It was my desire to set up our alter for this exploration. Now, an alter is not necessary – it is more of a witch-craft aspect than a Shamanistic aspect. However, it has been a long time since I have set up my alter and connected and honoured the Triple Goddess and Horned God, and I felt the need to do this. I added to it the usual east/south/west/north symbolisms: air/fire/water/earth, respectively, a symbol of the Horned god, and the Goddess (of course), and representations of our animal spirits, as well as a couple of candles. I welcomed and honoured the Guardians and spirits of each direction, to join us in our exploration, as well as the Goddess and Horned god. I did not cast a full circle – this was not a magic ritual we were intending to do, after all. We sat next to the alter, with a drum each, and looked at each other, slightly bemused, slightly self-conscious. Our intent and purpose this night was to attune and teach ourselves about Shamanic drumming; to find the beat within ourselves, and with each other. To understand the connection, to FEEL it. As we wish to explore Shamanic practice further, drumming is an important tool that we need to learn. All I knew was that a Shamanic drum beat is about 220 beats per minute. I have never experienced drumming of any kind before. So- we just gave it a shot. This was an exploration, an experimentation, held in joy, light of heart (in respect and honour) and learning. That’s when the beat took over me. My Mind was not in control of the rhythm: I had lost myself in the rhythm, it was as if my hands drummed of their own accord – and the drum sang back to me. There was no conscious urging of my hands; of controlling the beat or tempo, rather, my body instinctively took control whilst I lost myself in the sound of drumming. I felt my throat opening – the urge to Voice came – a wordless sound came out of me, accompanying the drumming, and Neometheus added his own wordless counterpart. Again, surprisingly, with voice added, something changed in our beats, our melody together – and more than that – I felt the tone of the drum resonate at the exact same pitch as my Voice. As I chanted my wordless song, my whole body thrummed at the same pitch as the drum: I felt the drum’s song flow into my throat; and vice versa. I can only compare this to the same intent as a Mantra. Neometheus added his rattle, experimenting with that too. It worked wonderfully. I stopped my chant, my drumming becoming more gentle. Neometheus started his own chanting, and I chanted a background counterpart. To me, lost in time and space, lost in rhythm and the Drum, it sounded beautiful, melodic, tribal. What it would have sounded like from an outside perspective, I can’t begin to imagine! Eventually we stopped, drummed out, and looked at each other. The silence was deafening. For us, we felt that we had experienced something profound – I got a lot more from the drumming than I had thought I would. Neometheus remarked that we ‘synched’ a lot quicker than he thought we would, and this was true. It had not taken us long, and the wordless chanting was an unexpected happening. It was an amazing first session, and I learned a lot from it. In the aftermath, we both felt ‘cleansed; as if we had done a Reiki session, or had a spiritual encounter. For me, I felt empty inside – a good empty, totally at peace, in balance, in harmony with myself and my environment. I had not expected the session to feel, to us, so powerful – not our first experimental exploration! But the Spirit of the Shaman’s Drum must have been with us that night – I cannot think how else to describe it. Listening to some Shamanic drumming on the internet later, we discovered our rhythm had been too fast: It’s hard to count 3-4 beats per second with no measure! Still, it had worked in a wonderful way for us. I look forward to continuing to learn and practice Shamanic drumming, and I know Neometheus does too – and now I truly know why it is termed ‘the Shaman’s Horse’! Neometheus will be back soon… he’s writing the very next post as we speak, entitled ‘The Holographic God’. Posted on February 17, 2013, in Shamanism and tagged Shamanic drumming, Shamanism. Bookmark the permalink. 5 Comments. Nice to read! Quite informative for me. Hello Alia, thank you for the wonderful comment. And a wonderful suggestion too, for a post – we shall start working on it straight away. In answer to your question no, the Horned god is not the same as the holographic god… you could say he is a facet, though – Neometheus described the ‘one divinity’ very well. Many people have a ‘skewed’ idea of the horned god, due to the christianization of pagan mythology. Thank goodness – or rather, the goddess, that this wonderful way of life, rich of culture, survived, through one form and another! I hope that our post about the horned god will put you at ease and understand his wonderful nature better 🙂 He is the complete opposite of the christian ‘devil’, and as far as I’m concerned, there is no resemblance whatsoever!